For our second Austin multi stop trip, we planned to hit the other Mueller-linked joints we hadn’t yet visited. First up would be John Mueller’s trailer on East 6th street, which had opened in February 2013. Next up would be his sister’s business which boasts an ex-Franklin cook, La Barbecue. 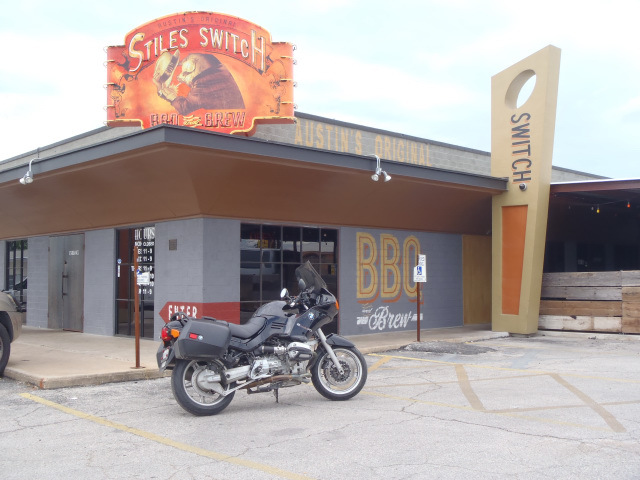 Finally we would meet up with the Austin cue-crew at Stiles Switch, where their resident pit master came from Louie Mueller – working his way up to the pits during his time there. While not as ambitious as our first trip to the Austin area, we had to be sure to hit the first two stops before they sold out. The lines there are nowhere near as crazy as Franklin and we planned to hit them one after the other. Stiles Switch was open late and didn’t have the same urgency. We rolled out of the house reasonably early and were cruising through Magnolia by 8am. I had mounted a new tire on the 5 spoke 17″ wheel I got for the BMW and it took a little to get used to the feel of the new tires. Maybe there was a little placebo effect, but it did feel a bit different. In an attempt to save a little cash, I went with a Michelin Pilot Power instead of a Pilot Road on the rear. The Power has better grip but at the sacrifice of life. With the weight of the BMW I might get as little as 2,000 miles on the tire which actually can make it more expensive than a longer lasting option, but I wanted to make sure the 17″ rear didn’t feel wonky or cut down on fuel mileage before purchasing the much more expensive Pilot Road3. With a slightly smaller diameter, the wheel would be spinning faster at the same relative speeds, and therefore the engine in theory would also be revving higher. In real world conditions I really didn’t notice much and our fuel mileage wouldn’t be noticeably altered. Passing the stretch where the forest fires came through in 2011, there were still a couple of smoldering piles of debris but by the end of the day this area would have no more signs of the fires and also no more signs of trees. The view is completely different than before; rather than cutting in between pine trees dense enough to not see beyond a dozen feet on each size, you could scan the empty fields for what seemed like a mile. We stayed on Hwy 290 and the ride was uneventful until just past Brenham. The roads displayed that tell-tale sign of rains that had passed through. Once again like our Lockhart trip the dap roads led to wet roads and led into rain. This time Leslye was with me but we didn’t want to stop; we didn’t bring rain gear anyway so I rode on. I thought about how much time I had just spent the day before cleaning all the grime off the bike from my last wet trip and sighed. I was listening to headphones and just then “All of my Love” by Led Zeppelin came on. Now the song doesn’t have anything to do with the rain, and maybe “Fool in the rain” by Zeppelin would have been a better option, but at that time and moment the song was just right. A bit somber, but it helped relieve any misery of the rain. The next song up was “Schism” by Tool, and that didn’t work well at all; it just made me angry. We crossed in and out of rain several times as we neared Austin. It had stopped raining but the roads were still very wet when we passed through Manor. Austin, Texas Department of Transportation or some evil super villain has decided to turn roads that have historically been free into Toll roads. These aren’t new byways created explicitly for toll roads; these are stretches of Texas interstate and Farm-to-Market roads that they are converting into toll roads. This is just downright evil, as you are now forced to either drop down onto the feeder road and deal with stoplights or pay a tool to ride through fairly short stretches of very necessary road. To add to that pain, the toll roads do not accept cash and are toll tag only. The entrance and exits are not nearly as clearly marked as they are in Houston either. So to avoid the very short stretch of Hwy 290 that is now toll, we stayed on the feeder through the construction. Tan colored dirty water streamed down and across the lanes and I had no choice but to ride through it. It was going to be ok though, we were headed to good BBQ. I kept my spirits up and kept riding. I remember once my mother had asked me about motorcycle racing: “What do you do when it rains?” I replied with a straight face, “We get wet.” This day wasn’t as bad as the Lockhart ride, but we were getting wet. We took Hwy 183 down and came into Austin from the East side. I did a check of the antilock brakes on the wet roads by intentionally stomping on the rear brake. It wasn’t the exact experience I expected – first a brief slide then the sound of the brake caliper slightly releasing and the bike slowing in a smooth decline. I still want to do a similar front brake check to be prepared for the feeling up front, but didn’t want to do it with Leslye on the back. 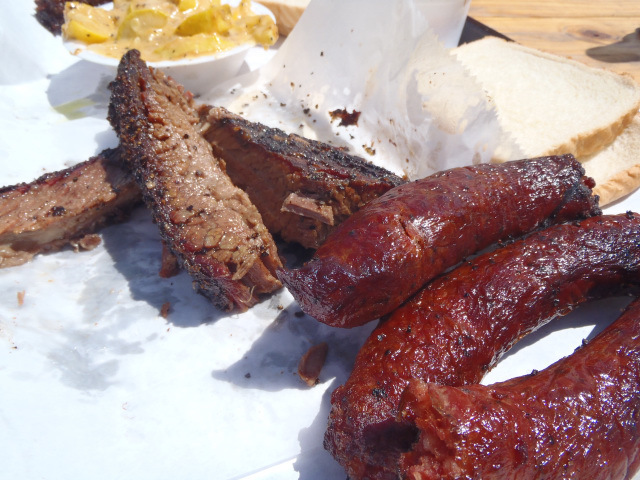 John Mueller Meat Company is located on 2500 East 6th street, at the corner of East 6th and Pedernales. You pronounce it with the “r” in front of the “p”. Well, most of us do anyway. We arrived at the location but didn’t know where to park. I did a couple of double takes and realized there is no parking specifically for the joint; you just park on the street. I saw the band walking up to the entrance with their instruments in tow, and peeking through the fence I could see a line had already formed at about 10:25am. After parking I walked up to the lot. You enter John Mueller’s from the alley. There is a small bar on the same property but it is unrelated to the BBQ joint. After walking up the short alley I turned right and met Leslye in line. They had started serving folks before 11, and many had already got their food and sat at the numerous wooden tables. The band was getting ready to play. A sign on the fence boasts “Austin’s biggest backyard” but this is really a pretty small place. 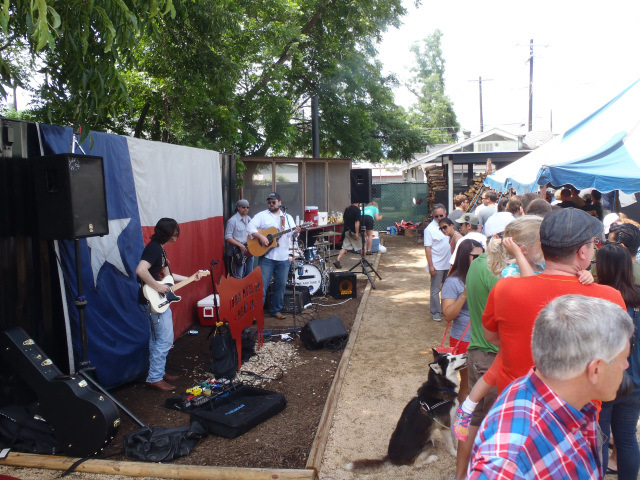 However, it really is a backyard Austin BBQ party. It’s exactly like something some friends or I would have thrown back in the day or even next weekend if we could. Except it has a live band. And it has one of the maestros of meat at the helm. This is exactly, and I mean exactly, the place I would have if I could pull it off. 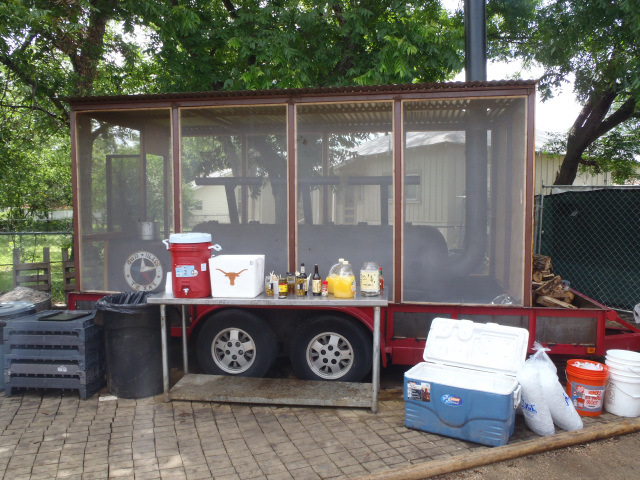 There are separate trailers for the pit and the serving window. 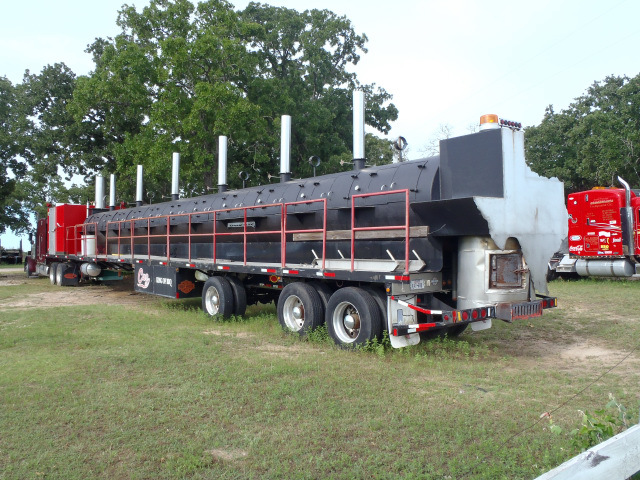 John Mueller was busy running fresh brisket and ribs from the pit to the serving trailer, but came over and somewhat bashfully told us there was free beer, bloody Marys, and screw drivers if we wanted. I chatted briefly with those near us in line; they didn’t even know that was John himself. 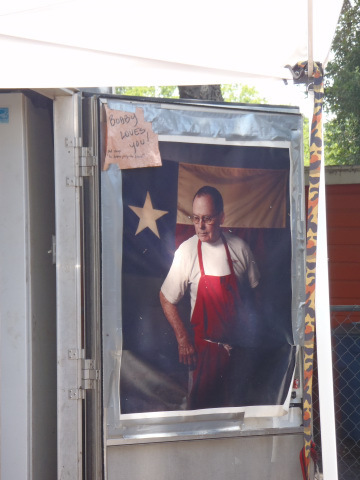 When he would bring a fresh brisket he would raise it and carry it like a trophy, past the line of us waiting and into the trailer to be served up fresh. Franklin BBQ, closed on Sundays, resides less than two miles away but these establishments might as well be on opposite ends of Texas. The line here isn’t something you endure, and the proprietors aren’t coming down the line trying to sell you beer and soda. Sure, there is a tip jar at John Mueller’s, but it isn’t shoved out in front of you. I as well as plenty of others were contributing and I hope they continue the tradition. 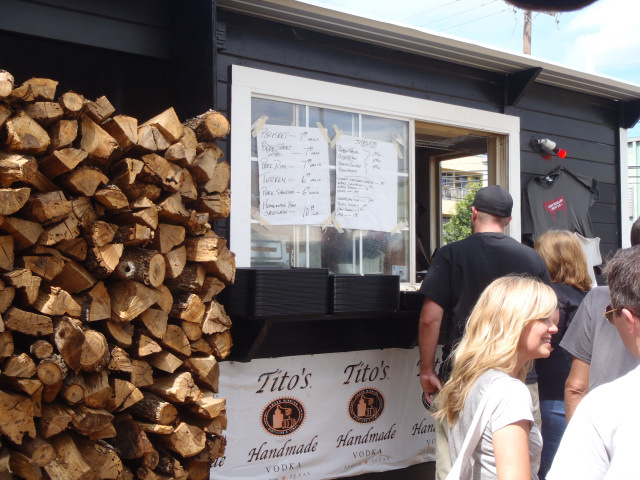 Listen to the live music, enjoy a cold one, and you might not even think about the line. The line itself was only about 20 people long when we arrived and moved quickly enough. When it was my turn I was tossed a sample of brisket. This tradition stems from Louie Mueller and I really like it. It’s not that I wouldn’t order the brisket anyway, but it’s just one of those things where they are friendly and also proud of their food. The brisket here is priced similar to Franklin, at just under $16 a pound. They had crossed out Beef Ribs, Potato Salad, and beans on the sign. This irked me because I don’t think they had run out so quickly, I think they just didn’t have any today. I didn’t ask for details but I hope this isn’t them overlooking details and is rather just running out from the day before. At any rate, I wasn’t too interested anyway and ordered the Squash casserole which was supposed to be good. I also tried to order a shirt but they were out of Large and Extra Large, so I ordered a small for Leslye. On the back they paraphrase a famous quote from Davy Crockett, “You may all go to hell. 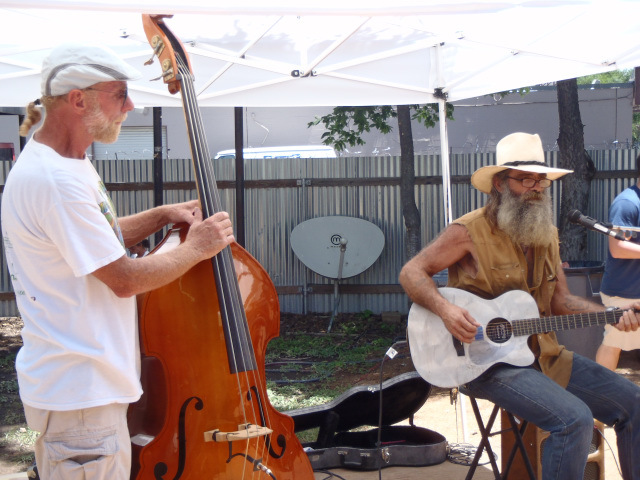 I shall go to 6th and Pedernales – John Mueller” John has had a storied and rocky history since leaving Louie Mueller. I’ll save that for another article but there is plenty to Google or read on Texas Monthly. I’ll leave it at saying that John is like the Johnny Cash of BBQ. We weren’t able to get a spot under the canopy so we plopped down under the sun. The brisket looked good, and had that black peppery bark that the Mueller family does so well. I took my first bite into a bark-heavy piece and it crunched like a potato chip. The fat was perfectly rendered, and the meat towards the center was moist, but the brisket was overcooked. When done to perfection the bark dissolves along with the fat and meat into one joyous flavor. Literally some people feel a tingle that travels from their mouth to their toes. I’m not joking here. I call it simply enough “the tingle” and I’ve had it at Louie Mueller, and to a little lesser extent at Franklin. It’s a wave of taste sensation that travels through your body. Others have written about it and I’m telling you that perfect brisket can do this to you. You can see it on people’s faces when it happens. Some laugh, some giggle, and some close their eyes and smile. They are giggling at how good a piece of BBQ is. This is the dragon that I chase. The sausage was a bit dry as well, but had a course grind and tasted of all beef which was good. John appears to love pepper, and it was in everything we had. 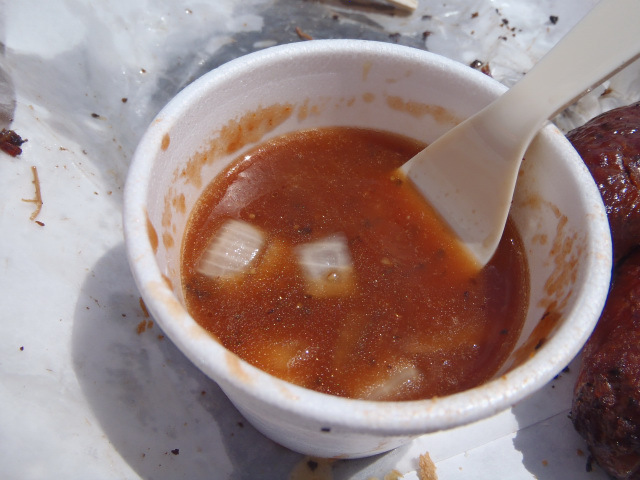 The sauce had large chunks of onion, with pepper floating in a very thin sauce. It was different than anywhere I’ve had, and it was fine as a “dipping” sauce. With a dipping sauce, you do just that. Rather than pour sauce over the majority of the meat surface, you dunk a piece into it and then bite. It’s not sweet, it’s not spicy, it just adds a hint of flavor rather than taking over. We hardly used the sauce at all; it’s really just an addition rather than a mainstay. Frankin, like many larger establishments, has commercialized their sauces and they are sold through HEB grocery stores. They have logo merchandise for sale and multiple shirt designs. John Mueller is at the other extreme, with only a simple shirt as his merchandise – and that’s perfectly fine with me. John made his way through the crowd a several times during our stay, but to me he appeared uneasy with the experience. I picture him as a bit shy, but someone who opens up when you get to know him. Also, he appears to shoot from the hip but is very straightforward. I don’t picture John saying anything behind your back that he wouldn’t say to your face. Maybe that’s why some people regard him as a bit rough, and although I don’t know him personally, he seems alright with me. He made enough time to let me get my picture with him, even during the rush. We dove into the squash casserole next. It also had flakes of pepper in a somewhat soupy base. I really liked it though and while I try not to deviate from the standard potato salad and beans, I will order this again. Leslye had a Barton Springs Soda company root beer, which was very good. We hadn’t had any of their sodas but will try some others when we get the chance. Speaking of ordering again, I am not dissuaded by the brisket on this day. I will return to John Mueller. I will also spend more time here rather than run off right after eating. You all may go wherever you want; I will go to 6th and Pedernales. On our way out I saw what I presumed to be the Livestrong headquarters, painted with a large mural. Since the admission of drug use by Lance I do feel bad for the foundation as many of their major benefactors have left. I have mixed feelings about Armstrong himself. According to so much other information, he didn’t win solely because he was cheating – he was just the best at cheating in an environment when the majority of the field was doing the same. He overcame cancer to become an elite athlete, and the EPO wasn’t everything – he dedicated himself to endless hours of training. By many accounts he was ruthless, rude, and has admitted to cheating and lying about it. While defending himself over the years he threw teammates and even their wives under the bus and made their lives difficult. I do feel betrayed though, and I look at the multiple books I have of his and now just see them as books of lies, even though as I mentioned – his training regimen and dedication was extreme. After leaving John Mueller Meat Company we tried to make our way to South 1st. East 6th street runs, appropriately, east to west and south First Street runs perpendicular. I grew up in Austin and knew the place like the back of my hand, but dammit if I didn’t make a wrong turn this time. We passed by the old Magic Time Machine location which is now a Joe’s Crab Shack and when we came to I35 I knew I went the wrong way. We traveled down I35 south to Oltorf and headed west to First Street. As we rolled down First Street I was stunned by all the change. “Funky” shops, tattoo parlors, and food trailer after food trailer lined the street. There were entire food trailer parks with various cuisines lined up. 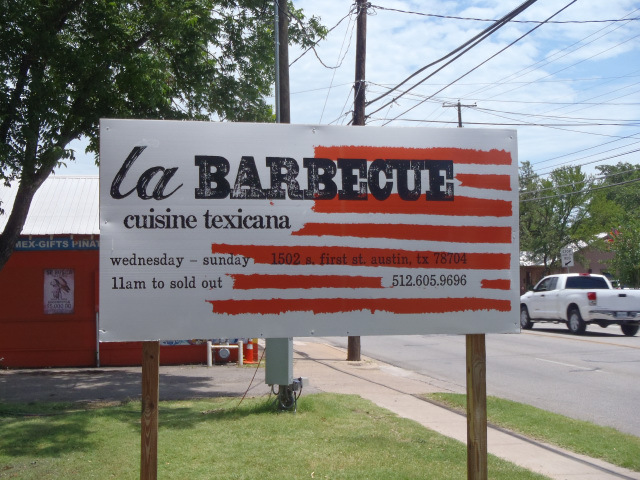 We almost passed the small spot for La Barbecue which shares a lot with a shaved ice trailer. Parking was easy for us as we nailed the last empty spot, but we would watch car after car pull in and then carefully back out and move down the road in search of a place to park. John Mueller has no parking at all but there is ample space on the streets around his place, but if you don’t get a spot at La Barbecue you may be in for a short walk from your car. We walked up to the line of about 10 people and settled in. There is a canopy over the line but it was now well after 11 and it was warming quickly. There was a table with a large tip jar and free Lone Star beer from a keg, and I noticed something very poignant and sweet. A poster of Bobby Mueller was taped on the trailer door with a handwritten note “Bobby loves you!” In smaller writing it said “and says you better prep the beans!” The poster and sign faced inside the trailer, but was visible when the door was open. 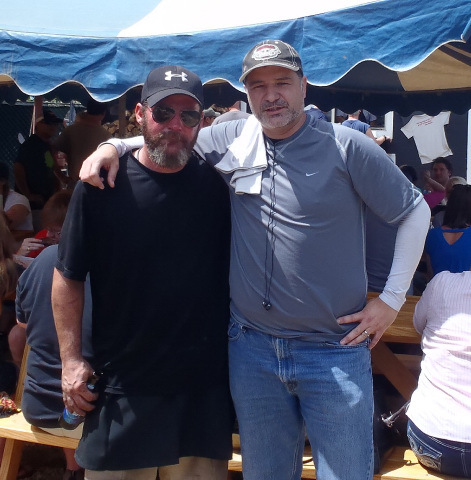 Bobby Mueller passed away in 2008 and his impact remains on the BBQ scene even today. The line here was mostly college kids, with the exception of a group of military personnel in their fatigues who showed up before we left. I again heard folks completely incorrect when talking about BBQ and history but continued to hold my tongue. I am not sure I consider myself an expert yet, but a lifetime in Texas eating BBQ and hitting around 30 joints in the last six months does make me feel closer to become one. I noticed the old tradition of always pumping the keg was in force. I understand that one needs to keep the pressure regulated, but the college kids especially seem to think it constantly needs to be pumped. Anyway, there was what looked to be a homeless man who had walked up to the keg. I eyed the scraggly looking fellow as he filled up his cup and figured that would be a pretty good deal if you wanted some free beer. 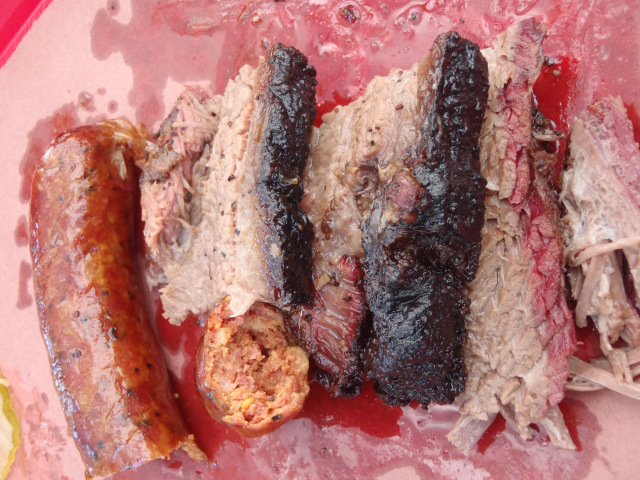 We sat down with our half pound of brisket and half pound of sausage and took the meat out of the butcher paper. Visually it looked great, and even though we had just eaten we were ready for more. The brisket was excellent, tender, and moist with well rendered fat and a decent bark. The rub here has less pepper than John Mueller, and not a lot of salt either. It was very good, and with one piece I did get “the tingle.” It wasn’t there more than once though. I still give the edge to Franklin and Louie Mueller over La Barbecue but I would rank it as a top 10 brisket. I cut open the sausage and yellow oozed out of the casing. I was perplexed at what it was; cumin, something else? One bite and it was easy to identify the taste of mustard. This was the first sausage I can remember where I could taste such a solid presence of mustard. There was a nice snap to the casing, it was plenty juicy to the point of being greasy, and I loved the mustard mix. I would say it was a tad undercooked for my personal preference; I like a little harder snap with strong marks on the casing from the smoke. Being this good I am sure I will return, and I think this may rank as my favorite sausage if not in the upper echelon at the least. We had forgotten to get sides so we tried to take a peek at what others were getting. We saw someone with cole slaw and it looked like it had BBQ sauce in it; it was an orange looking sauce mixed in. Looking at the menu afterward I saw this was called Chipotle Slaw. I’m not sure how it or the other sides tasted so I will make sure to order them next time. We also had passed on their specialty sandwich, the El Sancho. One of the downsides to trying to compare brisket-to-brisket is that we generally have to pass on specialties such as the Tipsy Texan at Franklin, and the El Sancho here. Sometimes we get a little different side but we are trying to be consistent. Admittedly we also veer off the straight and narrow with ribs here and there. I just can’t afford financially or with waist size to eat ribs and other options everywhere. With the giant beef ribs going for nearly $19 a pound here and knowing that one rib can weigh between one and half and two pounds, it would break my budget and belt quickly to sample them everywhere. 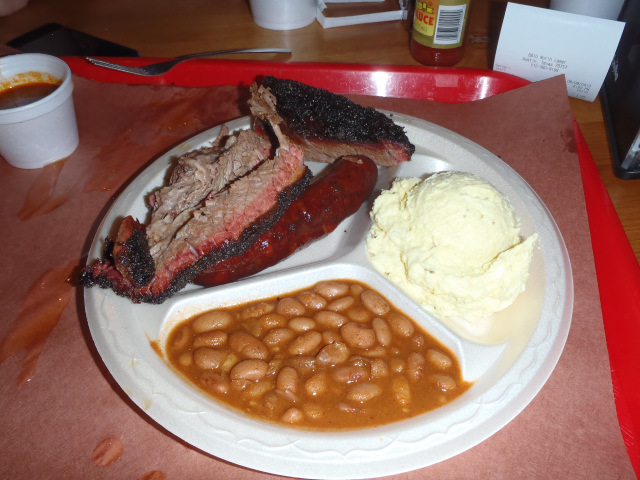 In subsequent visits to the top locations we’ll branch out but as mentioned before my staples are brisket and sausage, with ribs only an occasional choice. With two meals down we climbed on the bike and rode to Leslye’s mother’s house to do a little PC maintenance and let our food settle. We passed by Sandy’s Custard and Ladybird Lake, bypassing a photo opportunity with the Stevie Ray Vaughan. We also saw large Swan shaped boats floating on the lake but it was too hot to really enjoy something so leisurely. The wait was far too short in the air conditioning of the house though before we had to head out for Stiles Switch. Once again I made wrong turns due to my failing memory of Austin roads. This time it was to the tune of 3 wrong turns and a brief ride on a toll way. Stiles Switch is located in the old Violet Crown shopping center which was built in the 1950’s. The building was also in the movie Dazed and Confused playing the part of the Emporium pool hall. 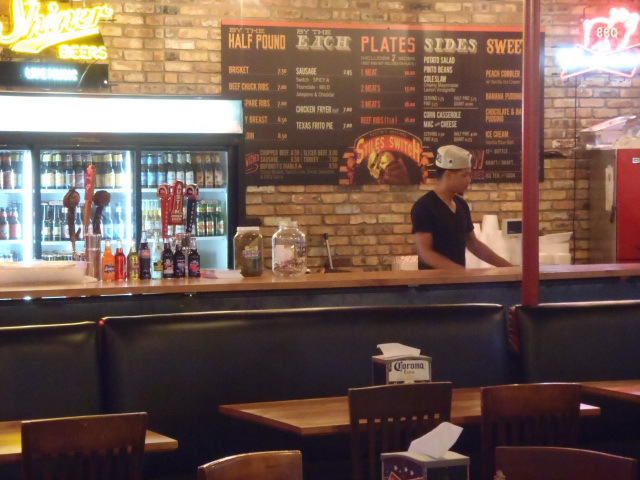 The owner has roots in Taylor, Texas and the pit master worked at Louie Mueller but the restaurant itself has only been open since January of 2012. We arrived a little late and I saw that our party had already arrived; My sister, Ernest, Cory, and Brook were inside and chowing down. Plenty of parking in a nicely paved lot made me more comfortable with parking the bike than La Barbecue. I opened the steel doors and walked into the nicely air conditioned and decently sized dining room. It wasn’t as massive as Kreuz but had lots of room. Looking across to the ordering line I only counted a few other small groups of patrons inside. It was about 2:15 in the afternoon so we were past the lunch rush and it was on a Sunday but it seemed lightly occupied to me. I ordered a two meat plate with potato salad and beans. I noticed they had a classic wood carving table and it had the undulations from use just like Black’s. The brisket looked great and I ordered a draft Austin Amber brew to round out my meal. The beer set me back $4.50, even at this time of day on Sunday. It was a letdown compared to my nearly free drinks from earlier. I would have expected happy hour pricing. When we got to the table the rest of the party wasn’t looking too enthralled with their meal. I took a bite of the brisket and found out why. There just wasn’t much flavor. One bite even had that plain “roast beef” taste with no smoke aroma. The bark wasn’t stellar either. It also lacked significant punch. It wasn’t too dry and was tender but just lacked flavor and was our biggest letdown of the day. The sausage didn’t fare much better. My jalapeno cheese was just too spicy. It was so much that when you took a bite the heat took over your senses, killing the other flavors. Ernest ordered some plain sausage and it was better but it couldn’t save the meal. The sides were ok but I had much higher expectations that maybe I should have so overall we were disappointed. I will cut them a little slack based on our arrival time, as brisket doesn’t hold well for hours, but dry brisket can still have flavor and we had great brisket at Billy’s in Bastrop two weeks prior so I won’t let them off the hook. With so many other choices around the Austin area it’s hard to recommend. If I wanted to impress someone with barbecue and didn’t want to eat at a trailer I’d probably drive to Taylor and hit Louie Mueller for lunch, or Opie’s out in Spicewood for lunch or dinner. They are open for dinner, you don’t have to wait outside in a line in the heat, and they have good, if somewhat pricey, draft beer. They also have games of washers that you can play out on the patio. We said goodbye to family and friends and rode off in the heat. We stayed on major roads on the way back as we did on the way out but did make a stop to take some pictures with “The undisputable Cuz” which is billed as the world’s largest BBQ pit. It was featured on Food Network and is also for sale. You can read more about it by clicking on the links and if you’re interested you can buy it for the sum of $450,000, but hey it comes with free shipping! Tags: John Mueller, John Mueller Meat Company, La Barbecue, Stiles Switch.